I sooo adore stars, especially if you can make them easily and quickly! 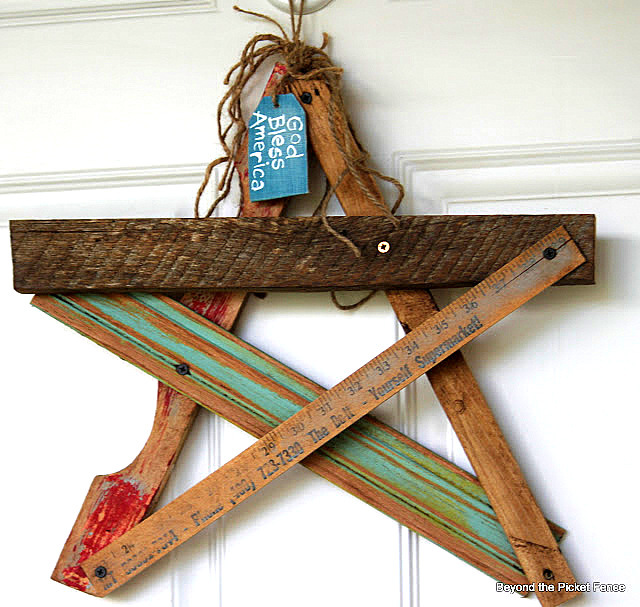 Here’s a fabulous collection of easy salvaged junk stars you could probably make with remnants at home right now! Leave it to Becky to pile on random boards, creating a star worthy (had to) work of ART. If you have a chunk of tin, you can have this star. Just cut one out! Tin snips would work if you didn’t have fancy tools. Thank Laurel’s husband for this cute thing! Love the dual rust/metal patina! Julia is one lucky lady. 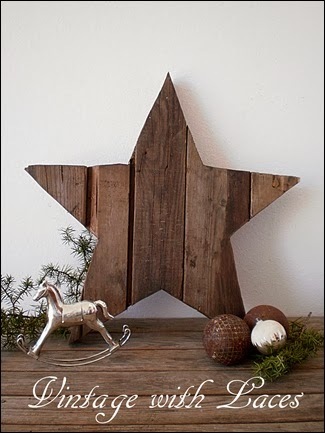 Her husband whipped up some pallet wood creations for her, with one of them being this cool, rustic star. Don’t you love the deep tones? Beth is another lucky gal. 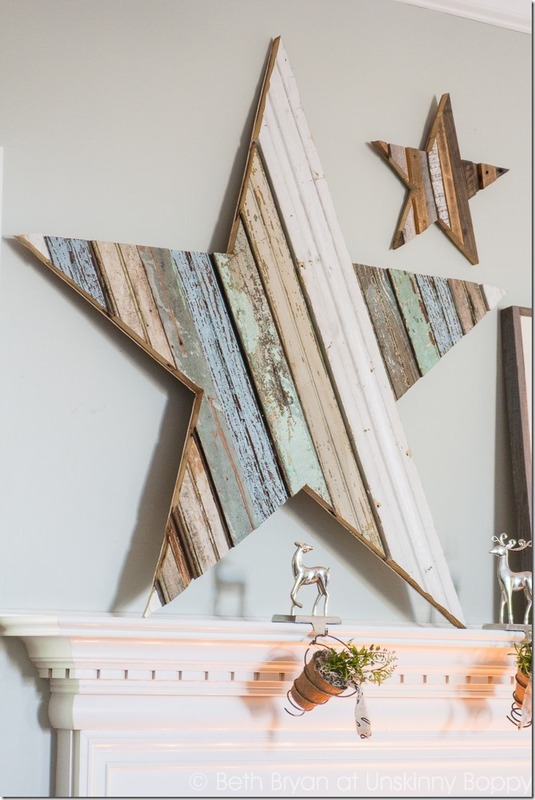 Her husband whipped up this star with plywood and reclaimed wood pieces. It stands a whoppin’ 42″! Isn’t it amazing? Excellent tutorial attached. If you want a quick and easy star in 5 minutes, raid your firewood kindling pile, hot glue the pieces on the ends and you’re done! Click the tutorial for a quick fix if the wood doesn’t meet up at the end. 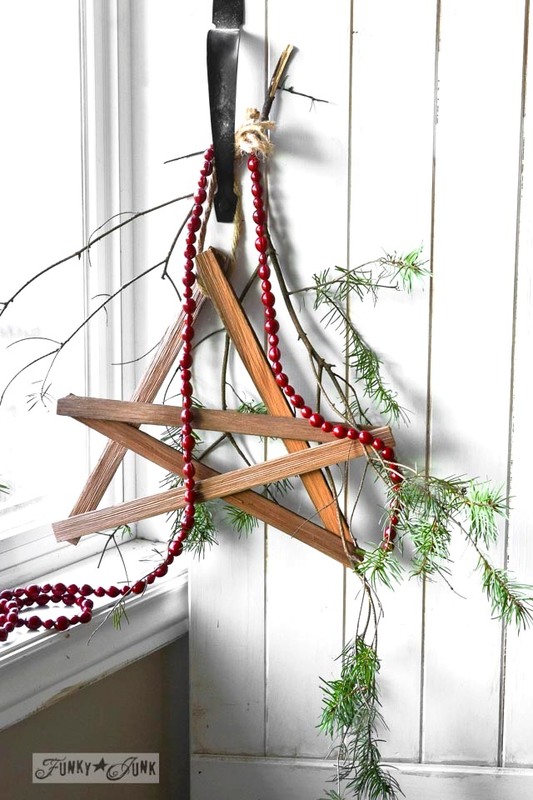 Have you created any salvaged junk Christmas stars? Winner of the Miss Mustard Seed Milk Paint Giveaway – Sue May Dechant! Congrats! You’ve been emailed! Thanks for the party, Donna ! Merry Christmas ! Merry Christmas Donna, thank you for hosting every friday, appreciated. Hi Donna, Thank you so much for the lovely feature and for hosting! I love the stars! Reach for the stars! Thank you for hosting! Thanks for hosting, Donna. Merry Christmas! 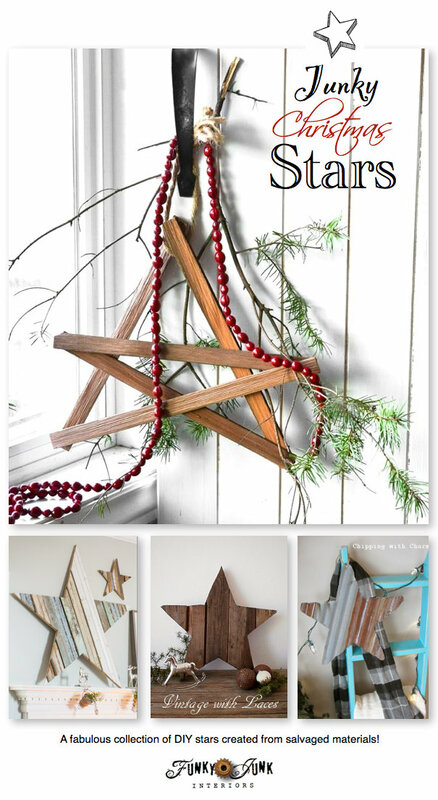 I am so excited about this week’s theme Donna- I just made some rustic paint stick stars a few days ago- perfect timing!! Thanks so much for hosting and wishing you a very Merry Christmas!! Thanks Donna for sharing my star. 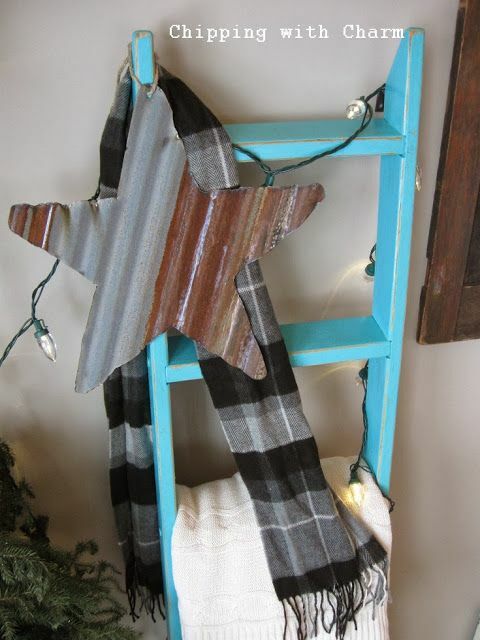 I shared another, my ruler star on top of a rustic nativity. I love a party that takes all weekend to browse! Thanks for hosting. Merry and bright wishes for your Christmas! Thanks for hosting. You are so stinkin’ creative! I love what you create, and you never stop surprising me. I wish I had junk at my disposal like you get your hands on! Have a very blessed and Merry Christmas. Hi Donna: The stars are beautiful! Thank you so much for hosting the party! Happy Christmas week Donna. I’m linking up something I’ve had for a long time but not exactly junk! Thanks for hosting and have a wonderful Christmas. I love the stars! Thanks for hosting the party. Merry Christmas!!! Thanks for another year of hosting Party Junk, Donna, and Merry Christmas! Merry Christmas Donna. Enjoyed joining in many of your Party Junks this year. The salvaged stars are so pretty. Maybe I’ll give them a try next Christmas. Thank you so much for hosting.